Honor started rolling out Android Oreo-based EMUI 8.0 update for the Honor 7X Smartphone in US. Android Oreo Features such as Notifications Dots, picture-in-picture mode, autofill password manager, support for adaptive icons, and Instant Apps just to name a few. The EMUI 8.0 features include a new floating navigation dock, Face Unlock, updated settings menu, and more. New floating navigation dock: With the newly added home screen shortcut, the floating navigation dock lets users navigate and operate their device from anywhere on the screen. Phone gallery recycle bin: Users can now restore photos and videos if they accidentally delete them. The Gallery in the new UI features a recycle bin which retains deleted photos and videos for 30 days. Seamless LinkedIn integration: Contacts and Email in EMUI 8.0 let users sync the career details of their LinkedIn contacts, making it faster and easier to manage contacts across platforms. Link up two Bluetooth devices: Smartphones are now able to connect to two Bluetooth devices at the same me, boosting mobile experience and fun. Face unlock: Scans a recognized user’s face to unlock instantly. It also prevents unlocking with closed eyes, and allows only device owners to see lock screen notification details, ensuring maximum security. OTA has already begun rolling out and Honor 7X in the U.S. it might take some time for the OTA to reach all devices. 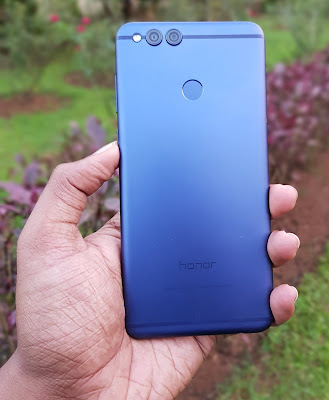 Honor 7X in India to get Oreo Update Soon.